Thank you Julie! I think it was watching another bird on a higher branch. beautiful b&w photo (as usual). Wonder who is watching most carefully. Thank you Mohammad! Nature is beautiful, even in b&w. Well done, and very interesting, with that curious look. I think the bird was keeping an eye on another one perched higher. Such a great photo ! I love all the detail one can see! I adore this – it’s beautiful! Okay hen, the first word out of my mouth was, wow. The detail and depth of the photograph is excellent. b&w is my favorite. Thank you very much Mary! I s saw you were fighting the flu, so sorry. Both my husband and I had it twice this year – highly unusual . Hope you are better and your energy restored . Beautiful and breathtaking at the same time! Thank you very much Robert! That is a great Monochrome! I would not have though of using a bird for a black and white. Thank you John! I kept looking at the picture and then it dawned on me to try b&w for it. Yes, the background was quite interesting. The bird also helped with its pose! Truly delightful photo, Hien. 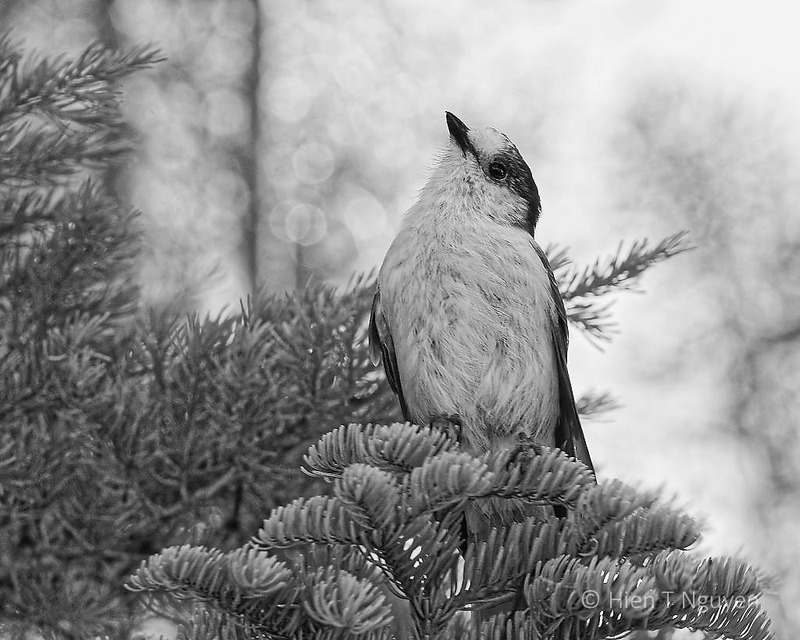 I liked the gray jay’s contemplative pose; and the patterns and textures you capture in the monochrome were wonderful. Thank you Jet! Monochrome was good for this picture.